1. Aaron Rodgers totaled 42.9 fantasy points in Week 16. That’s the highest-scoring fantasy game by any quarterback in the fantasy postseason (Weeks 14-16) ever. Started Rodgers in your fantasy championship? Send that man a fruit basket, he put your team on his back. Over the past 10 seasons, among all quarterbacks to play in at least seven games, Rodgers has ranked sixth (2017), first, ninth, first, fourth, second, first, second, first, and second in fantasy points per game. He’s been a top-two fantasy quarterback in seven of 10 seasons. 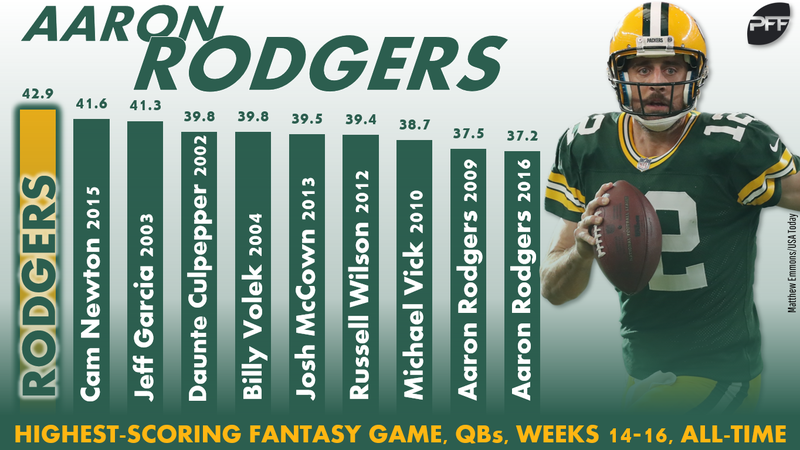 Outside of 2017 (skewed by injury) and 2015, Rodgers has been a top-four fantasy quarterback in every year of his career. However, 2018 was shaping up to be his worst season yet. He came into the week ranking just 11th in fantasy points per game (19.2). After his monstrous Week 16, he now ranks fourth (20.8). Preface for stats #2-5: If your commissioner set your league up right, Week 17 is a meaningless week for you – and is not your league’s fantasy championship game. That’s because too many teams have nothing to play for this week. For instance, the Cowboys have clinched their division with a 9-6 record. It makes sense for them to bench Dak Prescott, Amari Cooper, and Ezekiel Elliott. While they might not bench these players outright, it’s unlikely they play more than few drives. If so, then that incomplete game will later skew season-long fantasy averages (as it did for some players last year). This is also why, when looking at season-long stats, I sometimes strip out Week 17 and only include fantasy-relevant weeks (Weeks 1-16). For our next four stats, we’re placing each position’s most impressive 2018 fantasy season (Weeks 1-16) in a larger historical context. 2. Patrick Mahomes totals 399.7 fantasy points through Weeks 1-16, averaging 26.6. Not only is this the best fantasy season by any quarterback ever (even on a per-game basis), but, among all positions, it ranks third-best all-time in PPR scoring. In standard and half-point-PPR it ranks best all-time among all positions. Mahomes outscores the next-best fantasy quarterback by 4.8 fantasy points per game. For perspective, that’s greater than the difference between the top-scoring fantasy wide receiver (Davante Adams) and the wide receiver ranking 12th (Mike Evans). He outscores the worst possible starter (QB12) by 7.5 fantasy points per game. That’s greater than the difference between the top-scoring fantasy wide receiver (Adams) and the wide receiver ranking 21st (Cooper). As popular as “late-round QB” has been as a draft strategy, I’m expecting (but not necessarily recommending) Mahomes to be a top-15 fantasy draft pick in 2019. 3. Travis Kelce’s (283.4) and Zach Ertz’s (275.8) fantasy seasons (Weeks 1-16) rank fourth- and fifth-best by a tight end all-time. They rank behind only Rob Gronkowski’s 2011 season (300.1), Todd Christensen’s 1983 season (288.7), and Jimmy Graham’s 2013 season (285.4). Like with Mahomes, they offer a massive positional advantage to their fantasy owners. They rank first and second among tight ends, but eighth and 10th among all receivers in fantasy points scored. Kelce sits only 2.2 fantasy points per game behind Adams for the lead among all receivers. Kelce also outscores the third-best fantasy tight end (George Kittle) by 3.6 fantasy points per game, he outscores the fourth-best fantasy tight end (Eric Ebron) by 5.2 fantasy points per game, and he outscores the worst possible starter (TE12) by 9.6 fantasy points per game. Even more than Mahomes, Kelce and Ertz are worthy of top-15 fantasy draft picks in 2019, and maybe, due to their positional advantage, should be selected over any wide receiver. Bonus stat: In Week 16, Ertz broke Jason Witten’s single-season reception record. Witten had 110 in 2012, and now Ertz has 113 with one game to go. 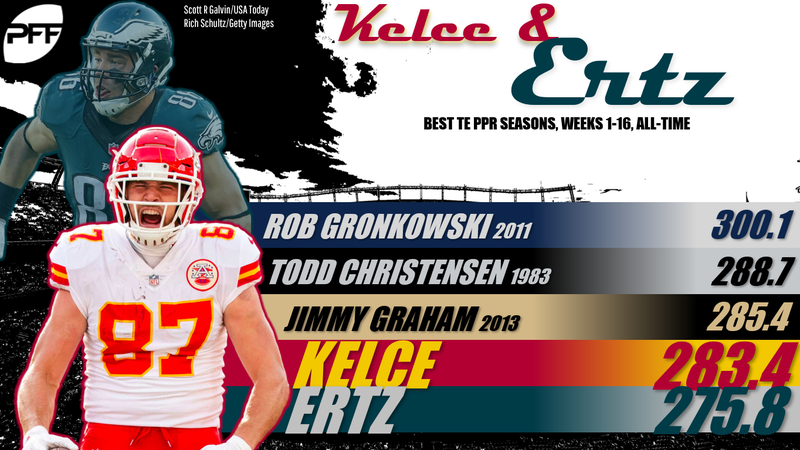 Kelce is on pace to break Gronkowski’s single-season yardage record. Gronkowski set the record in 2011 with 1,327, and Kelce is just 53 yards away with one game to go. Kittle could also get there with a big Week 17. 4. 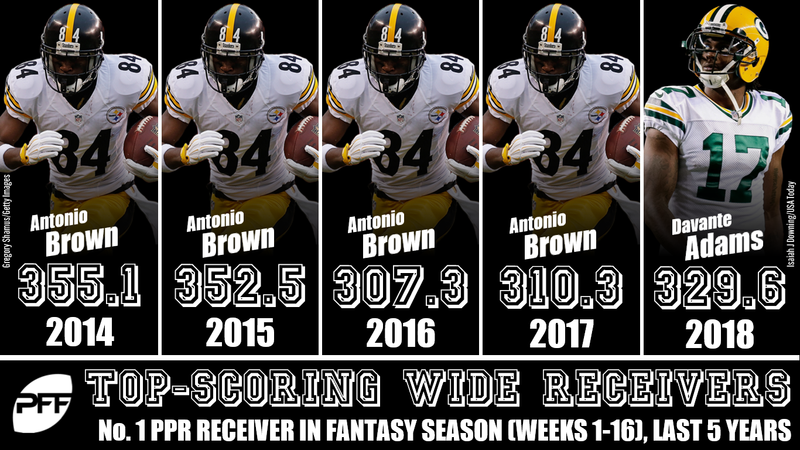 In each of the past four seasons, Antonio Brown has led all wide receivers in fantasy points during the fantasy season (Weeks 1-16). In 2018, Brown ranked second, 5.9 total fantasy points behind Adams. Could this be an indication that there is a new top wide receiver to own for fantasy? Is Brown (30 years old) officially on the downslope of his career? I think, possibly. Not only has Brown’s efficiency numbers been trending down, but now he has JuJu Smith-Schuster breathing down his neck and trying to cement himself as the team’s new No. 1. Smith-Schuster currently has 93 more yards than Brown, on 13 fewer targets. Schuster also came into the week ranking as our 14th-highest-graded wide receiver, while Brown ranked 31st (75.0), which would be the lowest grade of his career. 5. Christian McCaffrey leads all non-quarterbacks in fantasy points scored with 380.5. This is the 16th-most by any running back all time and the third-most by any running back this past decade, behind only David Johnson (2016) and Todd Gurley (2018).